Recreation volunteers bring a wealth of skills, knowledge and experience that support MPRB programs and events. They help provide opportunities for people play, learn, and grow. 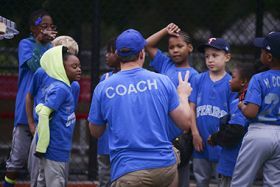 Volunteers are needed for youth sports programs throughout the city. Application: All coaches must complete an application, review Concussion Awareness and Prevention information and have a background check. (Additional training may be required for some sports). There are a variety of ways to get involved at our Recreation Centers and with events happening in the parks, citywide. For more information: Our Volunteer Handbook [PDF] provides an introduction to the Minneapolis Park System and includes volunteer-related policies, procedures and work rules. Do you have a skill that you would like to share? Tell us about it by filling out the Volunteer Application online or as a printable PDF. Questions? Contact recvolunteers@minneapolisparks.org or call 612-230-6493 for more information. Like us on Facebook.